Meet the cowgirl from Lone Jack, Missouri, 17-year-old, Alyssa Pemberton! Alyssa has been riding for 12 years and started showing only 5 years ago. While her family has always been into horses, her mom really had an impact on getting her into the horse business. Alyssa and her horse, Bentley, have been making a fantastic team for a year and a half. Bentley’s personality is her favorite thing about him! He is so willing and always makes Alyssa laugh with his goofiness. Continuously, Alyssa loves getting to spend time with her friends and specifically their furry friends at the shows but could do without the heat from the black chaps! Alyssa has had many memories in her horse career, but her favorite would have to be at a summer camp when they would tie a sled to a rope and drag them behind the horses in the arena! Although very hot and problematic, it remains one of Alyssa’s favorites. As far as accomplishments, this is no short list. 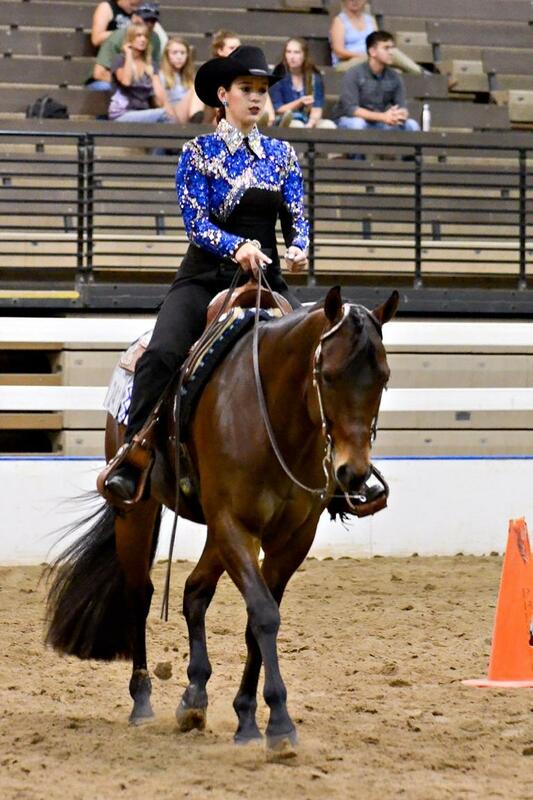 Just to name a few, Alyssa was top ten at Level One Championships, 2x finalist at Level One, Reserve High Point Novice Youth and Youth MQHA in 2017, Western Pleasure and Hunt Seat Champion in 2017, and most importantly, not messing up her patterns at Worlds! Outside of horses, Alyssa is kept very busy, as she plays basketball, soccer, track, and golf, and of course fitting a nap or two in between. She loves sleepovers and parties with her teammates after winning a game! If you are ever needing a dentist in the area, be on the lookout for Alyssa as she wants to be a dentist when she grows up. Her supporters are her parents. She does a lot of activities and it comforts her to know that she has their support in every one of them. In the next 10 years Alyssa plans on being finished with dental school, so she can continue her horsey hobby!